Cards: Score Supplemental 1991, Action Packed Rookies 1991, Star Pics 1991, GameDay 1992. When Mike Pritchard hit the field for the Colorado Buffalos he was a virtuouso on offense, displaying excellent athetic prowess playing runningback, wingback, tailback, and wide receiver on offense. He’d also handle some kick return duties as well along the way. 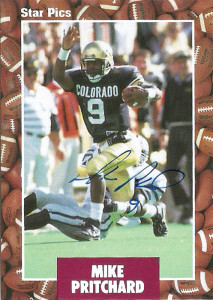 He’d finish his career for the Buffs, with 47 receptions for 1241 yards, and 10 touchdowns, along with 30 kick returns for 693 yards. Despite playing only one full season at wide receiver, Pritchard finished 3rd in school history in career receptions and 2nd in touchdowns. 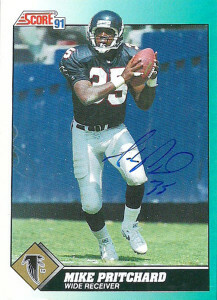 An All-Big 8 1st team selection and team MVP in 1990, Mike had 28 catches for 733 yards and 6 touchdowns. He also stood in for Eric Bieniemy one game and surprised the Volunteers rushing for 217 yards. Mike’s versatility and speed were attractive to NFL personnel. Jerry Glanville‘s Run ‘N Gun offense took him in the 1st round of the NFL draft with the 13th pick in 1991. Mike had 624 yards and 2 TDs in 50 receptions in a respectable rookie campaign. He’d then have 2 70+ catch seasons back to back in 1992 (77, career high) and 1993 (74). 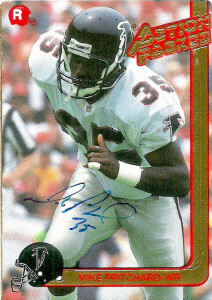 Expected to make a big free agent splash, Pritchard joined the Broncos in 1994, but injuries limited him to just 3 games. He’d return in 1995, starting 13 games and posting 33 receptions for 441 yards and 2 TDs, ending his tour with Denver. Mike joined the Seattle Seahawks in 1996 reviving his career. Pritchard’s 1997 campaign resulted in 843 yards and 2 TDs- his best since 1992. In 1998, Mike went deep again for 742 yards on 58 receptions. After the 1999 season, he’d retire just eking a bit over 5,000 career receiving yards. As of 2014, Pritchard lives in Nevada. He does play by play for ESPN and does color commentating for Nevada-Las Vegas Football games. Previous PostDixon, Hanford “Top Dawg”Next PostBeavers, Larry Jr.